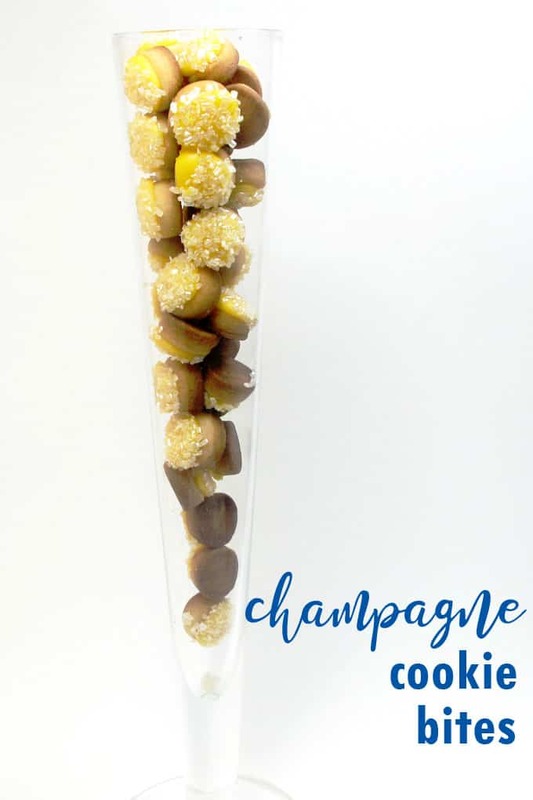 Fill champagne glasses with these sparkly frosted “champagne” cookies! 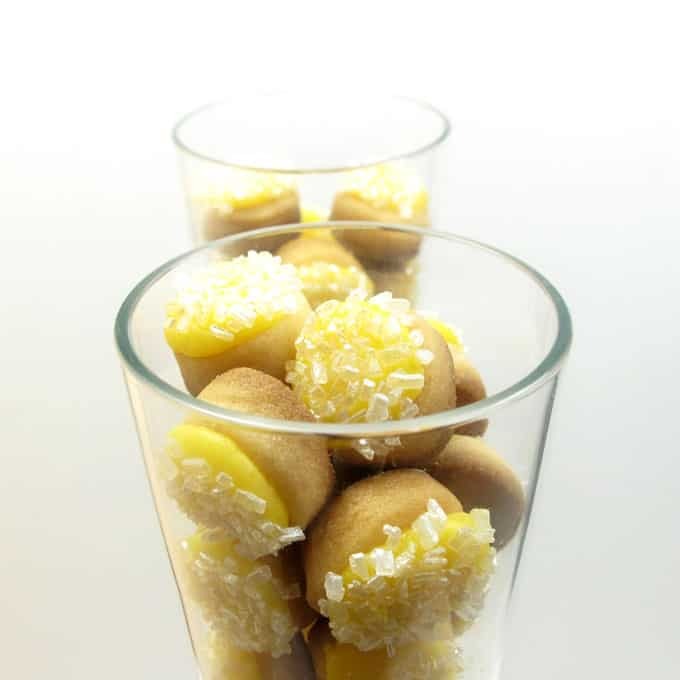 Teeny, tiny, champagne cookie bites, that is. And if you are wondering if decorating tiny cookies is tedious, yes. Yes it is. But these are really easy, too, because the sprinkles do all the work. Need more fun food ideas for New Year’s Eve? 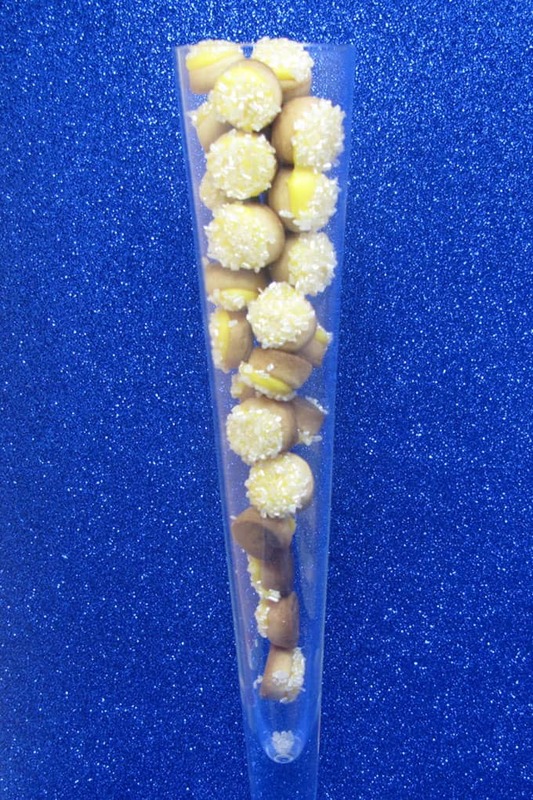 Try these sparkly gold marshmallow pops. 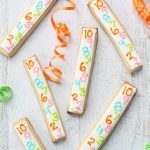 Or make countdown cookie sticks. Here’s a roundup of 30 fun food ideas for New Year’s Eve from around the web. 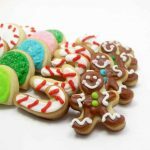 *Find the cookie cutter (this may be part of a set, or a fondant cutter), decorating bags, couplers, tips and sprinkles in the craft store. 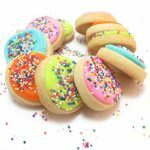 For food coloring, I use Americolor soft gel paste (Egg Yellow) For tips on finding cookie decorating supplies, click HERE. Roll out chilled cookie dough according to the recipe and cut out 1/2 inch circles. This will be annoying. Bake according to recipe, reducing cooking time by about half, and let cool completely. Prepare frosting according to recipe and tint light yellow with just a drop or so of coloring. Prepare a frosting bag with the coupler and tip, fill with frosting and tie closed with a rubber band. Pour some sprinkles in a small bowl. Hold a cookie with the forefinger and thumb of your non-dominant hand. With your dominant hand, pipe a large dot of icing on a tiny cookie. Immediately dip the top of the cookie in the sprinkles. Let the cookies dry overnight and arrange in glasses. Add a tag if desired. 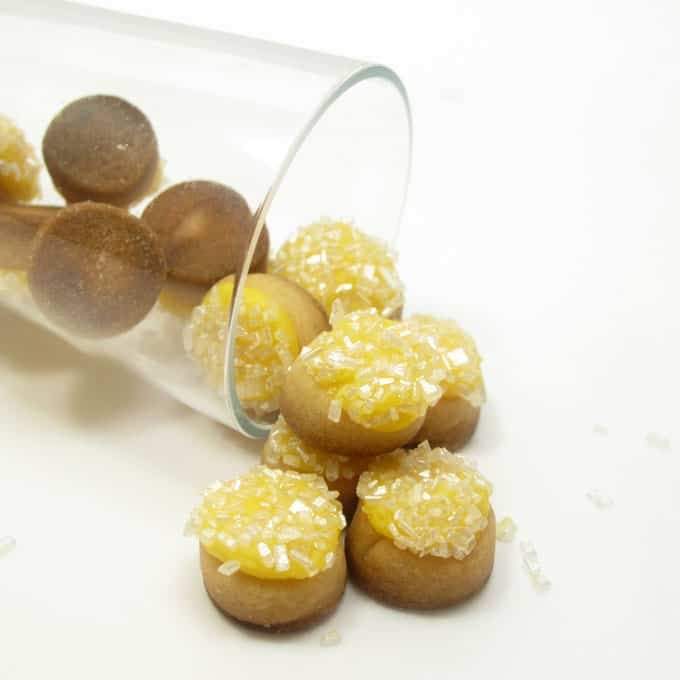 Super-miniature cookies – so cute. I feel like I need to make these in a zillion flavor varieties now. Those are way cute! 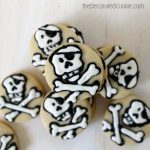 Are you going to post any New Year's regular cookies? I've been thinking of making some but wanted some ideas! Love these! 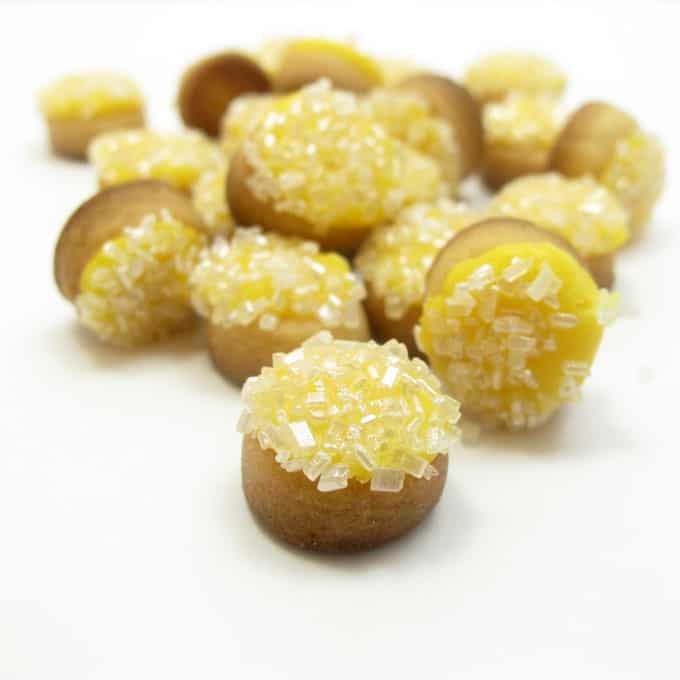 They are so cute and festive…like little champagne bubbles! I shared with my FB fans…I hope you don't mind! aw, thanks everyone! Hmm, miss v. I have an idea…. I'll work on something tonight! holy cow, so insanely cute…love anything mini…you know they kinda look like little pots of gold…. (maybe for st patty's day too! )…have a super new years…! This is SUCH a cute idea! Happy New Year! Brilliant idea! Happy New Year!! Cute party idea! Mini treats are always a hit. Happy New Year to you! New years parties are perfect for mini and most of all sparkles! PERFECT! These are darling and elegant at the same time! Nice! great idea and love the presentation! Congrats on food buzz top 9!! These cookies sound delicious, and they are beautiful as well :)! Congrats on the Top 9! Congrats on the Top 9! these look so cute! These are darling! I love mini's!!! Can you send me a link to the recipe?? When I clicked on it…it says not found…and I would love to try them out!!!! Thanks for sharing your darling ideas! oh, you guys are just the best!! I fixed the link Amalia, sorry about that!